FORT WAYNE – Before the TinCaps officially begin their 2019 season at Parkview Field on Thursday, April 4, fans are invited to a pair of free events at the ballpark. 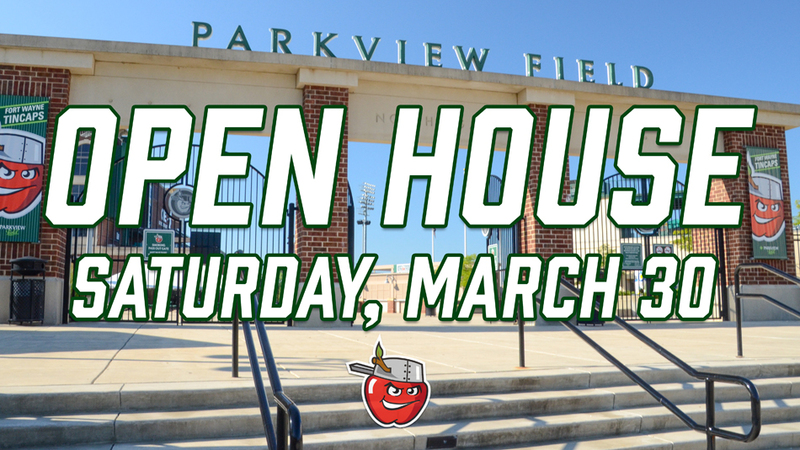 The TinCaps will host their annual Parkview Field Open House on Saturday, March 30, from 11 a.m. to 1 p.m. Free behind-the-scenes tours will allow fans to see the ballpark’s Suite Level, locker room area, the TinCaps’ dugout, and more. All of Parkview Field’s food and beverage menu items will be available at 50-percent off regular prices. Weather permitting, kids can also play for free in the Sweetwater FUN ZONE, while The Orchard Team Store will be open with new 2019 gear and apparel choices. Parkview Field’s Ticket Office will be open during the Open House, too. Tickets for Opening Day and the entire 2019 season will be available for purchase. Season ticket options are available, including 12-game, 17-game, half-season, and full-season ticket packages. Fans can also select tickets online at TinCapsTickets.com or by calling (260) 482-6400. Additionally, the TinCaps will have their annual Meet the Team Night on Wednesday, April 3, beginning at 5 p.m. featuring the chance to get autographs and (weather permitting) see the team practice. Fort Wayne’s parent club, the San Diego Padres, will announce the team’s roster by April 1. MLB.com, ESPN, and Baseball America have all rated the Padres’ farm system as the best among MLB’s 30 teams. The 11th season of TinCaps baseball at Parkview Field will start on Thursday, April 4 against the Lansing Lugnuts (Toronto Blue Jays affiliate) with a Thirsty Thursday presented by Rudy’s and feature Postgame Fireworks—the first of 30 fireworks shows this year. The TinCaps will also be giving away Magnet Schedules presented by Freschetta.